4:26 PM: Thanks for the tips. A big power outage that’s mostly to the south has affected a few West Seattle pockets – such as Arrowhead Gardens. Here’s the outage map. City Light says via Twitter that a crash on East Marginal Way is to blame. Updates to come. 4:38 PM: The crash in question is on East Marginal Way in Tukwila [map], according to the Seattle Fire log – while it’s not in city limits, they’ve sent mutual aid. 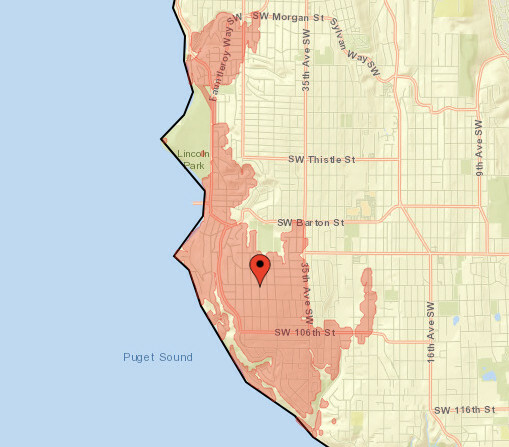 We’ve added a screen grab of much of the outage area (which stretches further into Burien beyond what’s shown – they’ve even closed City Hall early for the day as a result). In the full affected area, more than 16,000 homes and businesses are without power. We’re currently on Highway 516 westbound just east of Burien, about to exit to northbound 509, and it’s backed up – likely because much of Burien is caught up in the outage. Remember that a dark signal means all-way stop. 5:57 PM: Almost everyone’s back on – all but 300+. TV coverage shows multiple poles fell. WATER BREAK: If you are anywhere near 36th/Raymond and you are having water trouble, that could be the cause – a broken line. It has been reported to Seattle Public Utilities; no repair crew there yet when we went over to check. We have a call out to find out the extent of the break. POWER OUTAGE: We got a question about streetlights being out near 24th/Roxbury but homes unaffected. The Seattle City Light map shows what it calls a “planned outage” in the area affecting 26 customers. That’s the big dumpster you’ll find on the west side of the West Seattle Stadium parking lot until 3 pm, if you just can’t wait for snow-delayed garbage pickup any longer. As announced by the city, you can bring your trash – no recycling or yard/food waste, just trash – here (4432 35th SW) for free dropoff, today only. Seattle Public Utilities has people there to help if you need it – otherwise, drive/ride up, drop off, leave, no waiting while we were there. Residents with delayed pickup are also welcome to bring a carload or truckload of trash, recycling, and/or yard/food waste to South Transfer Station (130 S. Kenyon) until 5:30 today or 8 am-5:30 pm Sunday, for free. WHAT YOU NEED TO KNOW ABOUT SATURDAY: If you are a Monday, Thursday, or Friday customer, and you haven’t been picked up yet, keep your garbage bins out tomorrow. SPU adds, “We will also attempt to collect Thursday and Friday customers’ recycling and food/yard waste” continuing on Saturday. Tomorrow, you can also drop off trash (no recycling or food/yard waste) 10 am-3 pm at West Seattle Stadium (4432 35th SW). And all weekend, delayed-pickup customers can also take one carload or truckload (420 pounds maximum combined weight) of trash/recycling/yard waste to a transfer station. The nearest is South, 130 S. Kenyon, and it’s open 8 am-5:30 pm Saturday and Sunday. ABOUT THAT CREDIT: If you missed two pickups, whether you’re a Monday or Tuesday customer, you don’t have to report it to SPU to be eligible for the $10 credit, Register says. Following the historic series of winter storms that hit the Seattle region over the past 11 days, Mayor Jenny A. Durkan and Seattle Public Utilities (SPU) announced they will provide a $10 billing credit to residential customers who had two or more missed garbage collections due to inclement weather. The credit will be issued within two regular billing cycles for impacted customers, which are primarily customers with Monday service. In addition, any customers who have experienced delays in solid waste collection can put out additional bags of garbage, recycling or yard waste free of charge. The series of winter storms that the Seattle region caused an 11-day stretch of weather has adjusted and delayed the collection of garbage, recycling, and compost for 150,000 residential households and 6,000 multi-family accounts. At every safe weather opportunity, drivers collected waste from as many customers as possible, including critical locations like hospitals, multi-family buildings and high-volume commercial customers. The improved weather through the weekend will allow additional pickups to service customers who have been significantly delayed in solid waste pickup. Crews are prioritizing pickup for as many Monday customers as possible by deploying additional resources. Monday, Thursday, and Friday customers who have not received service are asked to put their bins and bags out to the curb beginning Friday, February 15 for pickup Friday or Saturday. Seattle Department of Transportation has also deployed their crews to assist SPU contractors by plowing streets where they encounter difficulties. Seattle Parks and Seattle Housing Authority will also assist Seattle Public Utilities as they work to resume normal pickups. West Seattle Stadium-35th Ave SW & SW Snoqualmie St.
8:30 PM: The online version of this announcement ends with two more paragraphs – reaffirming a free period at the transfer stations through this weekend, and offering contact info if you are due a credit and don’t get it. “I want to clarify that crews will be picking up garbage only, for Monday customers. Thursday customers, who will be picked up today because of the one-day delay, should also set out their recycling and food/yard waste and crews will make every effort to pick up all solid waste from these customers. Friday customers will get picked up tomorrow (Saturday). They should also set out garbage, recycling and food and yard waste and crews will make every effort to pick up all solid waste for Friday customers on Saturday. Solid waste crews plan to collect garbage from Monday and Tuesday customers (today), February 13th. Crews also plan to collect recycling from Monday customers in Northwest and Southwest Seattle (today). Customers missed last week may put out additional waste at no additional charge. Collecting garbage from Monday customers whose waste was not picked up the last two Mondays is the priority. Therefore, recycling and food & yard waste not collected from Monday and Tuesday customers (today) will be collected next week, on February 18th and 19th. Customers may put out double the usual amount of recycling and food & yard waste at no additional charge. (For the above three, too) If your collection was missed last week, you may put out double the usual amount of recycling and food/yard waste at no additional charge. …Additionally, Seattle residents significantly impacted by delayed pickups, due to icy residential streets, may visit the transfer stations for free February 13-16th. Customers are asked to indicate they are Seattle residents whose solid waste services have been delayed due to weather for more than a week. There are some caveats on those free transfer-station visits – go here for the latest on that. Meanwhile, Seattle Public Utilities (for whom Waste Management picks up residential solid waste) will be part of another 11 am mayor-and-department-heads briefing today, and we’ll add any new info that results. You can watch for the live stream here. 4:35 PM: Here’s the latest. We’ll update later this evening. Our trucks had significant challenges getting to all Monday and Tuesday areas today, even with chains and extra crews. If you are a Mon/Tues customer and your garbage was not collected today, it will be collected next week. Customers whose collection was missed may also bring their garbage, recycling, and food/yard waste to our north or south transfer stations for free. More info here: https://atyourservice.seattle.gov/2019/02/06/solid-waste-collection-resumes-feb-6/ … We know this can be frustrating. Thank you for your continued patience. 12:52 PM: The Seattle City Light outage map is itself out so we can’t gauge the situation without getting SCL comment, but we received some reports of flickering about an hour ago, and one report of power lost in Pigeon Point. Anyone still out, please let us know – thanks! 12:58 PM: The “full screen” version of the outage map is working – via that and a call to SCL’s media line, we’re told two areas are having problems – about three dozen customers between Charlestown Hill and Beach Drive, and the Pathfinder K-8 school area of Pigeon Point. 1:44 PM: Update from City Light – the school outage is resolved; the other two outages have separate causes, one related to a meter installation, one related to a fallen tree. And the main outage map should be functioning again by late this evening. With crews resolving the last West Seattle outage of note from Sunday’s windstorm, Puget Ridge has power again and the main South Seattle College (WSB sponsor) campus will reopen tomorrow. That word is just in from SSC. One of Puget Ridge’s two triple-digit outages was fixed this morning, the other one this afternoon. Seattle City Light is now down to just over 50 customers out of power around its service area – it peaked at more than 50,000 after wind as high as 60 mph moved through early Sunday. Due to a power outage, South Seattle College (West Seattle campus only) will have a delayed start until 10 a.m. on Monday, Jan. 7. All classes starting before 10 a.m. are cancelled. Any other changes, cancellations, delays – please let us know so we can report them too. MONDAY P.S. As reported here, the college is now closed all day. 1:53 PM: That’s the reason Harbor Avenue SW is closed by Jack Block Park – as we first reported in a 3:33 am update during our overnight storm coverage, the wind (gusting up to 60 mph) took down a pole and wires. Bicycles and pedestrians were being allowed through when we walked in for the photo a bit earlier. The 300+ Seattle City Light customers out in that area represent the largest outage remaining on the map for West Seattle, but SCL still has more than 9,000 customers out in more than 100 separate outages around its service area, so its crews have a lot of work ahead. 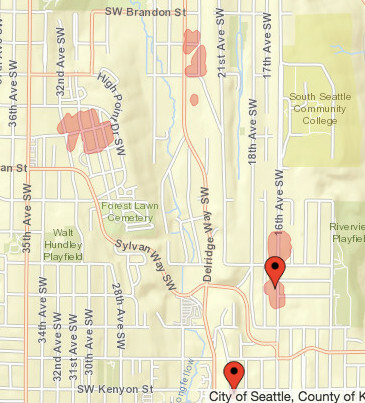 Some restoration work might temporarily lead to new outages, SCL explains (which has happened in parts of unincorporated North Highline, including North Shorewood, as crews work on a broken pole that handles three “feeders”). 5:17 PM: More than 500 customers are still out in West Seattle, including the 300+ in the Harbor vicinity, one of 100+ different outages remaining on the SCL map. 8:56 PM: New outage reported in Admiral area; we flickered in Fauntleroy. Another West Seattle business got the utility-bill scam phone call today and wanted to share the alert. Sleepers in Seattle in The Junction tells WSB they got one of those calls where the claim is made that a utility bill has gone unpaid and cutoff is looming unless payment is made immediately. All local utilities have issued repeated reminders that they don’t do business this way – here’s the City Light scam-alert page, for example. Lara reports brown tap water this morning in the 3800 block of 42nd Avenue SW. She says signage indicates Puget Sound Energy work is planned in the area but no crews were in view. Anyone else? Be sure to report discolored water to Seattle Public Utilities if it ever happens to you – 206-386-1800. 8:09 AM: As noted earlier, though the windstorm is long over, new outages have hit this morning, in High Point and toward the east end of the Roxbury corridor. We’ll be covering those in the hours ahead, and checking out windstorm damage/cleanup around the area. Thanks for all the tips and updates in our past 14+ hours of coverage – more to come! 8:24 AM: That end-of-Roxbury pocket, and the North Highline outage area it was part of, is back on. The SCL map shows a few hundred, mostly in North Delridge/Puget Ridge/Highland Park, still out since last night. 9:27 AM: Anyone on the water missing this? Karen sent the photo and says it’s beached in Lincoln Park. That tree has SW Orchard closed just north of Dumar. Police say the house’s residents heard it crack during the wind. They have evacuated. City Light has been called. 1:18 PM: The SCL outage map now shows only scattered, single-customer outages in our area. If you’re out and the map doesn’t show it, be sure SCL knows – 206-684-3000. Their map shows 2,500 still out, service-area-wide. Southwest Pool is closed the rest of today (Saturday, Dec. 15) and tomorrow (Sunday, Dec. 16) due to problems with the boiler following yesterday’s power outage. Please call the pool or check here for updates. ORIGINAL REPORT, 5:35 PM: If you haven’t been outside lately – or are getting ready to head home from work – the wind has arrived. As noted earlier, the National Weather Service downgraded the alert early this morning but still warned that gusts could get into the 40s; this is supposed to ease within a few hours. We’ll be tracking the storm in the meantime. No outages or other notable effects reported in West Seattle right now but if you see/hear about something, please let us know – text/voice 206-293-6302 – thank you. 5:38 PM: And minutes later … our power went out. Yours? 5:46 PM: More than 6,700 homes/businesses, as shown on SCL map. Also, a tree is reported down in the 2700 block of 51st SW. Also, another one in an alley in the 8800 block of 24th SW.
5:58 PM: As noted in our daily preview, MANY activities were scheduled tonight, so if anybody has official word of cancellations/changes, please let us know. We are headed out to check on some locations, such as the Sealth/Denny campus. Also, a revised total: The SCL map has this grouped as two outages, one with 6,740 customers affected, one with 957, so almost 7,700 homes/businesses. 6:07 PM: The West Seattle Community Orchestras concert that was scheduled for 7 pm at Chief Sealth IHS is postponed. 6:16 PM: For those asking about an estimated restoration time – the map currently just says “December 15” (tomorrow). But as we’ve noted in coverage of many outages (first one we covered was exactly 12 years ago tonight – the Hanukkah Eve windstorm), the estimates are relatively useless, could be much sooner, or much later. In this case, given the growing number of outages around the city, plan for later. Keep your fridge closed. 6:21 PM: Trees reported down in 5200 block 23rd SW and near 24th/Henderson, also trouble at 10th/Henderson. One event that is STILL ON – Denny IMS Winter Party (Posada) – they have generator power. (photo above). … More from scanner: Stop sign blown down at 63rd/Admiral. … Per comment: Chief Sealth/Garfield basketball is canceled. … WESTWOOD VILLAGE: We went over to check – Target/Barnes&Noble side is on, center stores on, QFC out and stores north of it – to Marshall’s – are out. West Seattle Be Prepared and the WS Amateur Radio Club were having their combined holiday party when the outage hit. Reports Jim Edwards, who sent the photo: “Between solar, generator and battery powered jug lanterns we are enjoying all that this season has to offer.” … Tree reported down near 18th/Orchard … Our crew says 24th SW is blocked at Henderson/Barton, with crews working on the reported downed tree there. Be on the lookout for lost pets (here’s our lost/found pets page) – we’ve already had two lost dogs reported tonight (and reunite one) – e-mail info to westseattleblog@gmail.com or text 206-293-6302. 8:30 PM: As noted in comments, the Morgan Junction business district has power. We are headed north on California and on that arterial, the outage is from just south of Mills, southward. … Alaska, Admiral Junction all on … so is Alki. 9:42 PM: Though the West Seattle outages don’t appear to have changed in size, the total number out throughout SCL’s service area is now 43,000+, down about 3,000 from the peak. Meantime, since we are now into the fifth hour, you might be interested in food-safety advice regarding what’s in your fridge, if you are in the outage zone. 10:15 PM: Getting reports of restoration in the High Point area. 10:30 PM: The map now reflects more than 1,300 West Seattle customers got power restored. 11:44 PM: Seventh hour without power for 8,000+ in WS. Throughout SCL’s area, 36,000+ are now mapped as out, down 10,000 from the peak. Meantime, we’ve heard about another downed tree, this one at Jacobsen and Hudson, via Alyson, who says it’s not blocking the road but appears to have brought down a cable wire. 12:54 AM: 8th/Elmgrove report of restoration via a comment. West Seattle outage is ~300 customers smaller in latest map update. Meantime, a fire alarm brought SFD to Bed Bath Beyond in Westwood, but no fire – they think the alarm was outage-related and are closing the response. 1:07 AM: Our power just came back on, after 7 1/2 hours. Hearing from others too. 1:28 AM: We’ve noted before that SCL’s new map lags more than its predecessor. Noting that now – we’ve been back on for more than 20 minutes but we’re still shown as out. So we don’t know yet how many got power back in that last wave. The map shows 30,000 still out, service-area-wide. We’re working on the daily highlight list right now – assuming everything’s on as scheduled but let us know at westseattleblog@gmail.com if not – then once it’s light, we’ll be looking around for storm damage – please also let us know if you’re dealing with anything (downed trees, etc.) – thank you! 7:43 AM: A few reports of power going out again in part of High Point a few minutes ago. Ours in Upper Fauntleroy flickered. 7:59 AM: Launching a new report on current outages and aftermath. (added) Find it here.